Zacuto’s DSLR Gunstock Gorilla kits are for shooters who are on the go, run’n’gun, gorilla shooters. They go from tripod to handheld in seconds and weigh virtually nothing. Perfect for journalism, event and indie shooters looking for Zacuto quality, infinite adjustability as well as an affordable price. When shooting photographs holding the camera is possible, but when shooting HD video you need multiple points of contact to steady the camera. 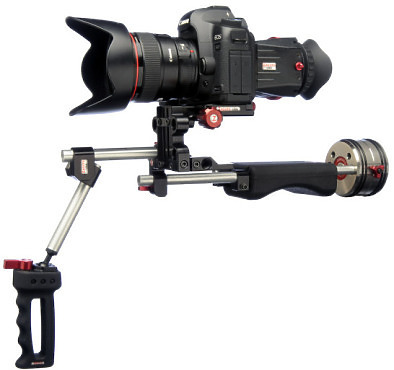 Get a Gorilla kit and become a steady Zacuto Gorilla shooter. Quick Draw is light and easy to handle and have no base-plate or rod platform. Everything is quick releasable. The user can quickly free the camera from the gunstock by flipping the lever on the quick release tripod plate. The Quick Draw is similar to our Rapid Fire but uses a handgrip instead of the chest as a point of contact. Weighing in at only 1lb 3 oz, it is our lightest gunstock shooter. It has 2 points of contact by using the handgrip in one hand and your other hand on the camera.